Being one of the reputed organizations in the market, we are engaged in providing an exclusive range of Magic Bread Slicer. Adjustable guides for bread size Blades designed for speed & minimum wastage Replaceable blades. Contact part made up of SS 304 food grade Stainless Steel. Crumb outlet is provided to collect the cutting waste. 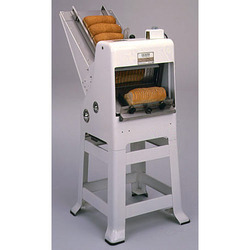 We are offering a broad range of Table Top Bread Slicer Machine. These products are enormously employed in the market due to their longer life. 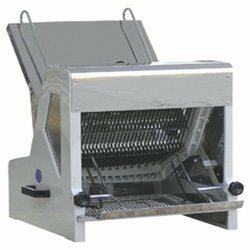 The Bread Slicer is a high-performance machine that takes up very little counter space and is perfect for bakeries, specialty sandwich stores, hotels, cafes and trendy bread joints. Bread slicer is a kitchen utensil that assists with the uniform cutting of bread slices from whole loaves of bread. With evenly slotted spaces a half an inch apart and parallel to each side, the Bread Slicer allows for a knife to enter on one side, either left or right and be guided through the bread using the opposite side as a stabilizing guide while slicing. We are a unique name in the industry to provide our prestigious clients an exclusive range of Restaurant Bread Slicer. The machine can slice 400 Gm loaf is into individual slices of 12mm to 15 mm thickness. Power driven bread slicing machining fitted with 1Hp motor, volt 220, single phase.